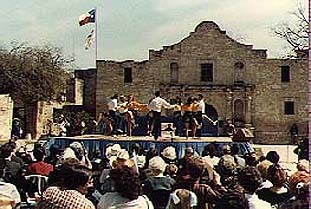 The cloggers have participated in several trips to Mexico. On one of these journeys, in 1989, team members performed in Cuernavaca, Mexico and, in addition, Rusty and I also taught at a Folk Festival in Oaxtepec. 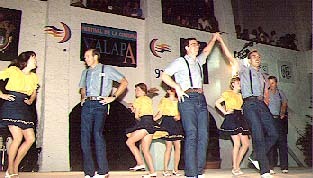 Later, in 1993, Fire-on-the-Mountain Cloggers performed in Xalapa at an International Cultural Festival. A funny thing happened during our brief stint in Old Mexico. Because we prefer to be known by our trademark denim skirts and yellow blouses, the Fire-on-the-Mountain Cloggers have basically kept the same costume for many years. 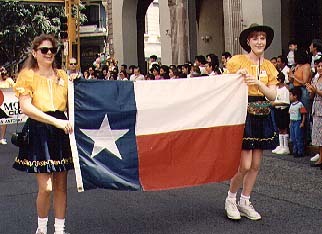 This probably explains the reason we were part of a parade going through downtown Xalapa (in Veracruz) when we heard a voice with an unmistakable Texas accent yell out, "Fire-on-the-Mountain! I see you every year at Folklife. What are you guys doin’ way down here?" Fire-on-the-Mountain hit the road in 1984 to perform a number of shows at the World’s Fair in New Orleans. 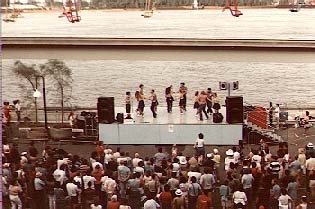 The International Riverfront Stage was right on the bank of the Mississippi River. We returned a few years later to perform at the Super Dome for an International Lions’ Convention. San Antonio is a tourist town with restaurants, shops and attractions built along the banks of the beautiful San Antonio River. For $2 you can take a barge ride downstream and admire the historic landmarks along the way. However, public barges were scarce and secret service frogmen were combing the river bottom early one Wednesday morning in 1991. Reporters, tourists and locals lined the RiverWalk in anticipation of catching a glimpse of Her Majesty. 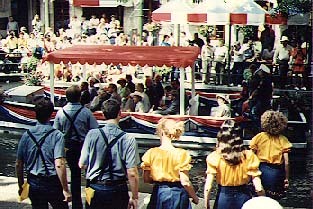 Fire-on-the-Mountain Cloggers had the honor of performing for Queen Elizabeth II of England during her visit to the U.S. Later the next year the group also presented a clogging show for President Richard von Weizaecker of Germany. Through the years our dancers have performed for various dignitaries who visited our fair city.